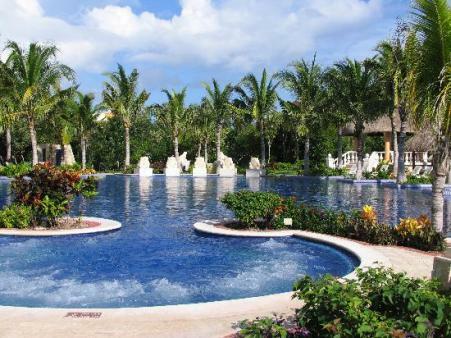 Barcelo Maya Resort is part of the Palace family of resorts; known for great quality. Upon arrival at your resort, you will be greeted with a welcome cocktail. The beautiful beach at this all inclusive family resort is nice! The ocean water is crystal clear and great for snorkeling in the Riviera Maya. What is unique about this All Inclusive Resort? Check out the awesome adult only pool! What are the pools like at this family resort? 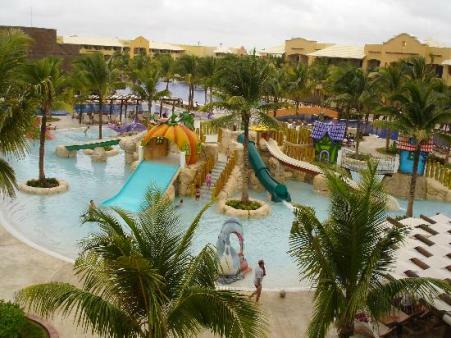 This all inclusive family & couple resort has one HUGE pool that goes throughout the resort. There is an adult only swimming pool if you need a little extra peace and quiet. The pools also have natural rock waterfalls and one has a large jacuzzi for extra relaxation. A lap pool is open until 10am and then the lanes are taken out to create a normal pool. A kiddie pool is also available complete with a kiddie waterpark that will be the highlight of your kids beach vacation! 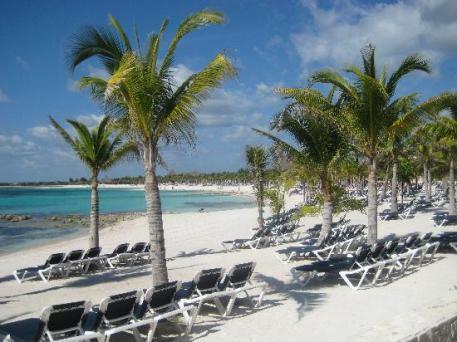 This resort offers lots of activities that are included in the all inclusive price. With all these activities you will never be bored! What restaurants are at the Barcelo Maya Hotel in the Riviera Maya? This all inclusive resort in the Riviera Maya has 2 buffet restaurants. One is an International buffet and one a Hacienda style Buffet. If you are staying 4-6 nights at this resort you get 2 tickets for the a la carte dinner places. If you are staying at least 7 nights you get 4 tickets to the nice restaurants. pool bar for a quick drink on your way to the beach or pool! and of course adults like me! I can never get enough ice cream! Room service is available but is not all inclusive. You have to pay $4 per item. Is there a Spa at this resort? Barcelo Maya has a 1500 sq. meter Spa! not pamper yourself! Your on vacation!! 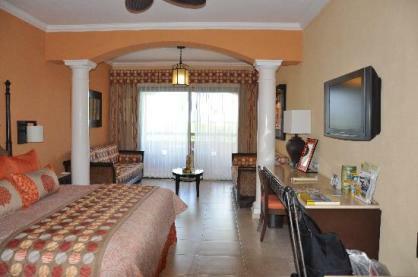 This is your room at the Barcelo Maya Palace Resort in Riviera Maya! What will my room be like at Barcelo Maya Palace? Looking for adult only resorts?